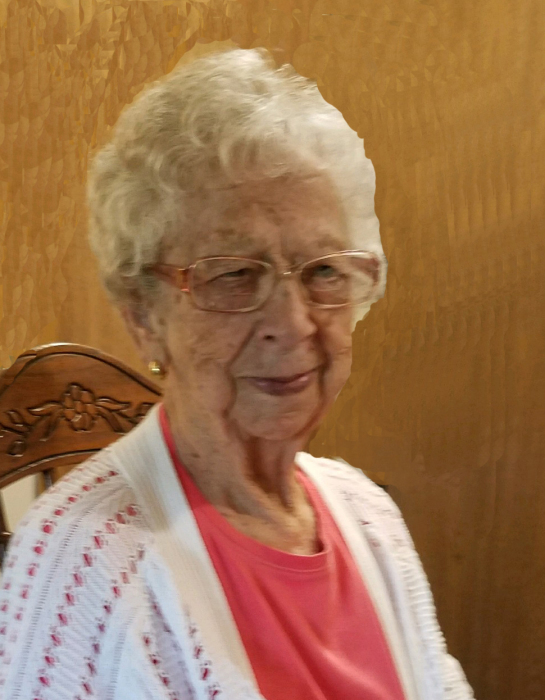 Hazel M. Vestrum, 95, of Barrett, formerly of Hoffman, died on Thursday, March 28, 2019 at Alomere Health in Alexandria. Hazel Muriel was born on March 24, 1924, in Lands Township, Grant County, the daughter of Herman and Nelsine (Jorgensen) Johnson. She was baptized and confirmed at Lands Church in Hoffman. She attended rural school through 8th grade and High School in Hoffman. In 1941, she was united in marriage to Henry Vestrum who was in the blacksmith business with his father and brother. Four children were born to this union, JoAnn, Janice, Harley and Bonnie. Hazel worked as a store clerk in Hoffman for several years. Henry passed in 1994. Hazel was a member of Lands Church now Messiah where she was active in church activities. She volunteered at the Good Samaritan and was a member of Sons of Norway. Hazel enjoyed baking, watching the Minnesota Twins, crocheting and flower gardening. Most of all she cherished spending time with her family, children and grandchildren. Hazel is survived by her four children, JoAnn (Les) Halverson of Wilmar, MN, Janice (Don) Nasstrom of Barnesville, MN, Harley (Jeannie)Vestrum of Carlos, MN and Bonnie (Gary) Gulbrandson of Donnelly, MN; 10 grandchildren, Lori Halverson, Mike (Amy) Halverson, Jeff (Angela) Nasstrom, Jennie (Warren) Bigalke, Joel (Andrea) Nasstrom, John Vestrum, Luke (Jill) Vestrum, Brock (Leahnor) Vestrum, Brent (Kim) Gulbrandson and Amy (Ryan) Murray; 20 great grandchildren along with numerous nieces, nephews and a host of friends. She was preceded in death by her parents, Herman and Nelsine; husband, Henry; seven sisters and two brothers. Visitation: Monday, April 1, from 5-7 P.M., with a 6:30 prayer service at the Erickson-Smith Funeral Home in Hoffman and continuing one hour prior to the service at the church. Funeral Service: 11:00 a.m., Tuesday April 2, 2019, at Messiah Lutheran Church in Hoffman. Funeral arrangements are with the Erickson-Smith Funeral Home of Hoffman.